Attached is a Poster of the Sanskrit Alphabeth. 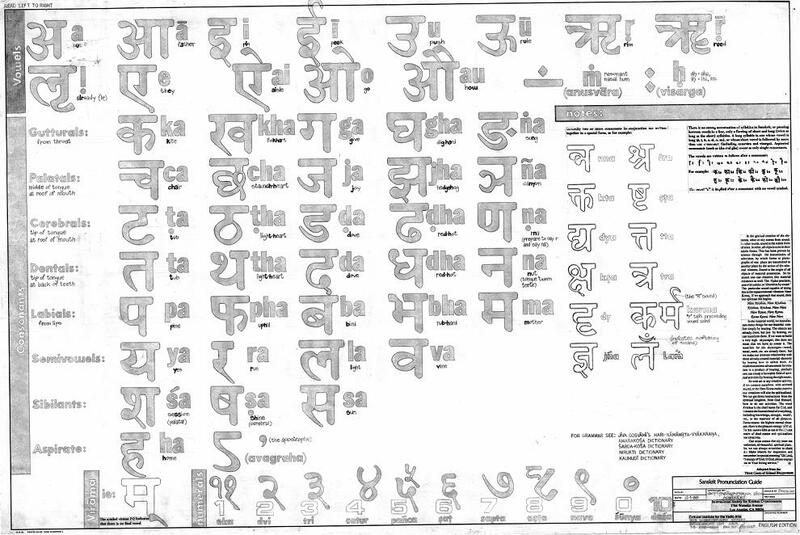 Attached are a two page 'sample' of Sanskrit Flash Card. [i'm posting these two pages only because the file is too big to attach entirely through this site]. The file (a MS Word Doc) is a total of 20 pages to be printed out double sided. This will create 10 double sided sheets. You then cut-out the 8 "cards" per sheet thus leaving you with 80 "Flash-cards" of common sanskrit phrases. This can be done with the 2 pages sent herein. I got the phrases from The Book by Hari-kenu (sp?) Prabhu's Book "Sanskrit Grammer" [He's a german Iskcon Brahmacaryi]. Since this is an attachment please let me know if the sanskrit does not show it's self on your computer when you view it, Please. Having downloaded the *.doc file, the sanskrit letters are not showing. What to do? --this is a font that my computer has, by way of my having installed a program that uses the 'Indevr' font. A program that uses the 'Indevr' font is Srila Prabhupada's Folio files or some such program that 'displays Sanskrit Devanagari' as part of its function. So, you may just down load the 'Indevr' font. 2) -- If your computer already does display the 'Indevr' font --then highlight the scrambled text and then choose and thus apply the 'Indevr' font to the text. highlight and apply the font style that is used on your computer to show Devanagari. 4) -- Best advise is to open this MSWord Doc in a computer that already utilizises the 'Indevr' font and that would display the sanskrit properly. Click on the Thumbnail to see it.